Drive engagement with your customers’ favourite channel. Live chat is already an effective way to fulfill consumers’ desire to connect with companies and is customers’ preferred channel for engaging with your company. This isn’t really news anymore; in the last decade, live chat has become an increasingly common feature in digital spaces and has been deployed successfully for a number of use cases (from increasing ecommerce conversion rates to generating qualified leads to resolving technical issues). Here’s the challenge: as your customers become more familiar with live chat, their expectations of its service and capacity to help them in their journey rise. Customers’ expectations are increasingly elevated because they are having better prior experience with live chat. And that is making it harder to exceed customer expectations and deliver an outstanding, remarkable customer experience. If you aren’t already utilising live chat to generate leads, increase conversion, or support customers throughout all lifecycle stages, you need to get started with live chat ASAP. Your customers are expecting it from your site, so meet them in the channel they desire. If you already have a live chat programme, it’s time to consider its efficacy and the knock-on experience for your customers. I’m not talking about the tools your live chat software can provide (most software companies are batting along similar averages now in what they can offer); I’m talking about the management, processes, and hard statistics of your live chat programme from team PDPs and QA to ROI, CSAT, and value of leads generated. One of the easiest ways to audit your programme is to undergo a comprehensive live chat health check in which a deep dive of your GA data, marketing strategy, journey mapping, and goals are analysed with chat in mind to ensure you’re delivering conversations where the data tells you to. Missing revenue opportunities and creating rather than solving UX issues are two of the most common problems we see when auditing website for potential chat deployment or audits of current chat programmes. Customers expect chat to be consistently easy and effective at answering their questions and resolving their issues. There are so many so-called chat management providers in the world now, it’s more important than ever that you’re not sacrificing quality for cost. Your customers’ expectations are higher than ever and you need to exceed these at every turn to continue ‘wowing’ with chat. A comprehensive, holistic live chat strategy will pay off no matter what your goals. However, if your focus is increasing conversions, leads, or online sales through the power of chat, then putting in place an ROI-generating programme is key to success. Not only can chat boost your sales volume but, if deployed well with a data-driven strategy, it can be a powerful way to retain and delight customers. According to eMarketer and Forrester: 38% of online consumers made their purchase due to a chat session; there was a 20% average increase in shopping cart size with chat engagements; and 63% of online consumers said they were more likely to return to a website that offers live chat. Working to optimise existing chat programmes and develop new strategies as a live chat outsourcer, The Chat Shop delivers an additional 50% increase in leads from existing traffic, an increase of up to 15x in ecommerce conversion, and a channel CSAT score of 99% – the highest in the industry. Page abandonment: a visitor is mousing toward their address bar. A proactive chat fires to keep their attention (and interest) on your site. Cart abandonment: basket abandonment rates will always be too high for you. 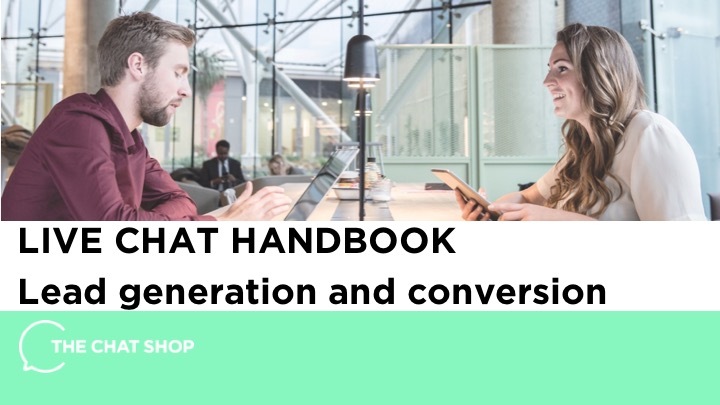 Engage with your visitors through proactive chat at the key steps of the checkout process to break down conversion barriers. Form fatigue: conversion rates double when you cut your forms from 4 to 3 fields. But you’re losing data, so enhance or completely replace those notorious forms with lead-generating conversations in proactive chat. Make sure the proactive chat invitation is on-brand and tailored to each visitor’s specific journey. Don’t use the proactive chat greeting for your checkout page on a form page; deliver the right message at the right time. Ensure that you’re reaching out with a proactive invitation at the appropriate moment, too; how long do your visitors wait on a page before they decide to leave it? Take that data and harness it to deliver proactive chat when it matters most. Only add value with proactive chat by getting the context for your invitation right. Conversational marketing is powerful, but only if you’re leveraging data. If you want to use proactive chat to promote a holiday deal or opening a savings account, then don’t deliver proactive chats to your customers who have already booked using your holiday offer or already have savings accounts. Use as much data as possible about your audiences and segments to create rules on the types of proactive invitations each visitor sees on a granular level. Your marketing team invests an enormous amount of time in your brand promise and your customer service team spends a lot of time delivery that brand promise. But this means that ownership of a channel like live chat is split between marketing, who own the website, and customer service, who run the conversations. De-siloing to make your live chat effective is an imperative part of delivering a stellar customer experience. This is a driving force of our live chat strategy; bring marketing, sales, customer service, and brand promises together, understand chat’s goals for each team, and build a strategy that serves all of them, collectively Because live chat is now a key part of your customer experience, and because customer expectations of chat are climbing, you need to ensure live chat is optimised. No matter how your final live chat strategy looks, you have to deliver a personalised, one-to-one experience for each customer. Consumer expectations are high, and the only way to surpass them is with a truly personal message. That’s why empathetic chat conversations can deliver such stellar results and why live chat is such an effective extension of your marketing team. So, what’s stopping you from turning live chat into a lead-generating, converting machine? Learn how to get the most out of your traffic with live chat best practices.